London (CNN) -- The head of the Intergovernmental Panel on Climate Change has described as "tragic" the lack of action on climate change by developed countries. Rajendra Pachauri told CNN's Principal Voices program that there is a limited window of opportunity to stabilize the earth's climate and avert the worst impacts of climate change, such as rising temperatures, melting polar icecaps and extreme weather events. "If we allow things to continue unchanged and we don't take action today, it would destabilize human society," he warned. The Nobel Peace laureate's comments come as more than a thousand representatives of governments, environmental organizations and research institutes gather today in Accra, Ghana to resume talks aimed at negotiating a new international accord to combat climate change. The new agreement -- to be finalized in Copenhagen, Denmark by December 2009 -- will succeed the 1997 Kyoto Protocol which is due to expire in 2012. Under the Kyoto Protocol, 37 developed countries committed to cut emissions by an average of 5 percent to 1990 levels by 2012. Despite initially signing the protocol, the U.S. refused to ratify it on the grounds that it unfairly burdened developed countries. While developing countries -- including new economic powerhouses like China and India -- were exempt from obligations under the Kyoto Protocol, there is some hope that a new agreement might draw them in to the climate change process with incentives aimed at curbing emissions from deforestation and forest degradation. But Dr Pachauri says a more enlightened view of the developing-versus-developed country situation is needed. Do you agree with Dr Pachauri? "Developing countries will do what they can, but it was clearly understood and laid down in the Framework Convention on Climate Change in 1992 that the developed countries will take the first steps; frankly they've done nothing at all. And that's really tragic. "We came up with the Kyoto Protocol in 1997, but it got ratified only in 2005. It took so long to give substance to something which had been agreed on in 1992." While hard decisions aren't expected from the weeklong Accra talks, they will discuss treaty language which will likely be approved at the final climate change meeting for 2008 in Poznañ, Poland. It's at this Poznañ meeting that countries will start discussing specific targets for reducing carbon emissions in line with the ambitious goal of cutting greenhouse gas emissions in half by 2050. 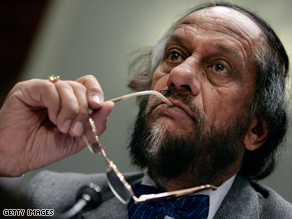 Dr Pachauri told CNN that halving greenhouse gas emissions will require great resolve by the international community. "I hope that in the next year and a half -- and particularly in December 2009, when we hopefully will come up with an agreement on what to do beyond 2012 globally -- that we show a certain resolve and aspiration to do things that are required for the benefit of the human race."